The Tasty Page is officially one month old! To celebrate and thank everyone that’s read my blog, tried the recipes, liked The Tasty Page on Facebook and Instagram, shared my posts, commented, and just threw me and The Tasty Page a bunch of love, I’m making piña coladas for everyone! These aren’t your average piña coladas. These piña coladas are especially special. 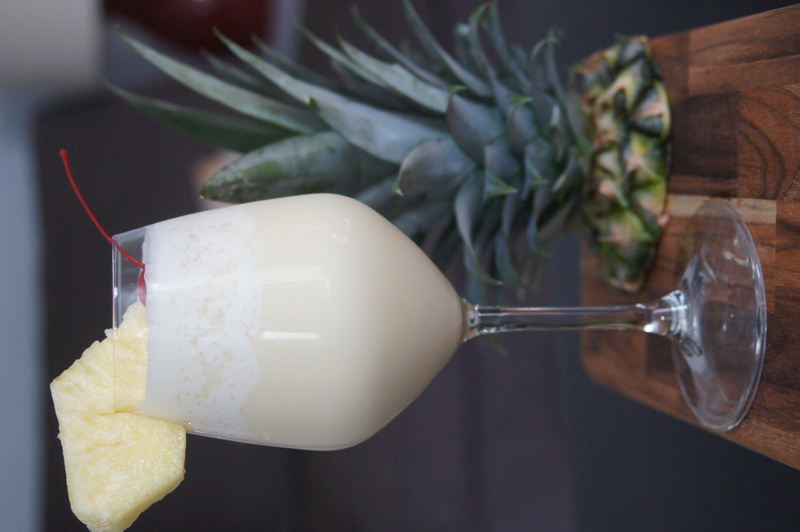 This recipe comes straight from Caribar at the Caribe Hilton in Puerto Rico and birthplace of the original piña colada. When my family and I visited Puerto Rico, it instantly became one of my absolute favorite things. This piña colada will always remind me a very happy time and it’s not solely because I had a few of these each day. And because it’s special to me I wanted to share it with you all and thank you. A special toast and shout out goes out to my husband, Jon, who makes The Tasty Page pretty, is the best editor ever, and my biggest cheerleader. Cheers to Jon and cheers to all of you! Thank you and I’m looking forward to celebrating many anniversaries together! Add the rum, cream of coconut, cream and pineapple juice in a blender. Add the ice and blend until smooth for about 15 seconds. Serve in a 12-ounce glass. Garnish with a fresh pineapple wedge and a maraschino cherry.